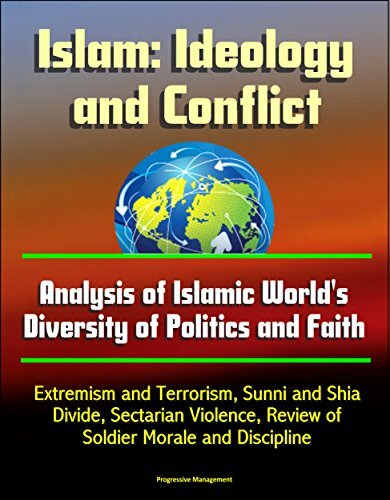 Obtenga el libro de Islam: Ideology and Conflict - Analysis of Islamic World's Diversity of Politics and Faith, Extremism and Terrorism, Sunni and Shia Divide, Sectarian Violence, ... Historical Conflicts (English Edition) de U.S. Government en formato PDF o EPUB. Puedes leer cualquier libro en línea o guardarlo en tus dispositivos. Cualquier libro está disponible para descargar sin necesidad de gastar dinero. Professionally converted for accurate flowing-text e-book format reproduction, this work is more than historical scholarship; it argues for an understanding of the Islamic World, Islam's roots and how those roots explain the political challenges of today. This is essential reading for anyone who is interested in making sense of sectarian violence, Middle East peace, and counterterrorism policies—for Islam is more than just a Sunni-Shia divide. There are layers of Islam that the author peels back to reveal the pretense that is the idea of Islam as an ideology. The central theme of this monograph is that Islam as a unified community is in actuality "imagined" communities fraught with fractures that help explain contemporary issues. This argument is broken down into three critical issues. First, it provides an overview of the conflicts in early Islam that are still the source of many conflicts today. Viewing the Islamic World as one entity or made up of major sects (Sunni and Shia) is misleading. Rather, a review of Islam's historical conflicts in the context of political, social, economic, and cultural issues allows the reader to understand that Islam cannot be assumed as a universalistic whole (i.e., Pan-Islamic movements). Just as Christianity cannot be viewed as a one-size-fits-all religion, Islam must be understood for what it is and is not. Islam is a complex religion with a vast history of internal conflict that speaks to contemporary issues today. Islam is not, as many in the West believe, a unity of belief and purpose that is tied to discussions on terrorism and radicalism. Second, the shifting U.S. role relative to Islam is presented. The very forces with which we contend today have often been our allies in the past. The U.S., in its short history, has been involved with the Islamic World from the very start. It was a Muslim country, Morocco, which first recognized U.S. independence. However, as the U.S. role in the world grew, so did the conflict with Islam. The post-World War II era saw the U.S. break out onto the world stage; the discovery of Middle East oil brought Americans and American companies to the region; and U.S. recognition and support to Israel all brought the U.S. and Islam in conflict. Since 9/11, the U.S. has invaded two Muslim states, while at the same time trying to "win hearts and minds" in the Islamic World. According to the National Security Strategy (May 2010), ".. .this is not a global war against a tactic—terrorism or a religion—Islam." Negative Muslim perceptions of the U.S. need to be understood if there is any hope of reversing the trend. Finally, the monograph deals with contemporary Islam, radicalism, and the issue of a fractured community. The current world of Islam is in many respects no different from the Islam during other periods in its history. Islam's internal conflict highlights the reason why Pan-Islamic movements never gain traction and the disjointed nature of radical Islam. While Islam might provide a common "cover story" for movements and groups, it is the local political, social, and cultural issues that are driving their policies and actions. Dr. Barrett posits that the West must focus less on Islam as an ideology and more on those local issues that drive the threat.